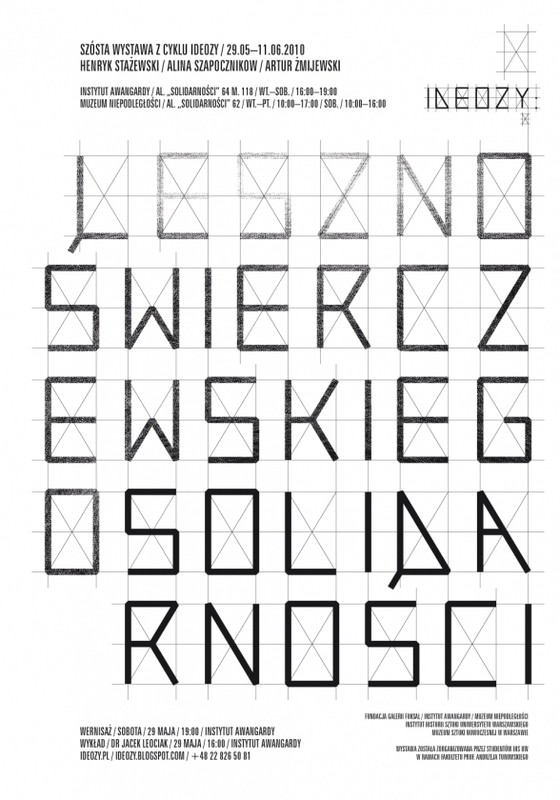 Leszno/Świerczewskiego/Solidarności is the final exhibition of the Ideoses series, prepared unusually in collaboration with the Museum of Independence. The exhibition turns towards themes of the place, the close vicinity of Henryk Stażewski’s and Edward Krasiński’s studio flat, highlighting and exploring traces of things that are no longer — the Warsaw Ghetto, the Lenin Museum, placed by the communist regime in a former Radziwiłł palace, and finally, Henryk Stażewski’s avant-garde works collected from his studio following his death in 1988. The presence of the doyen of the Polish avant-garde is brought back by means of Relief no. 27, which the artist created here in the 1960s. 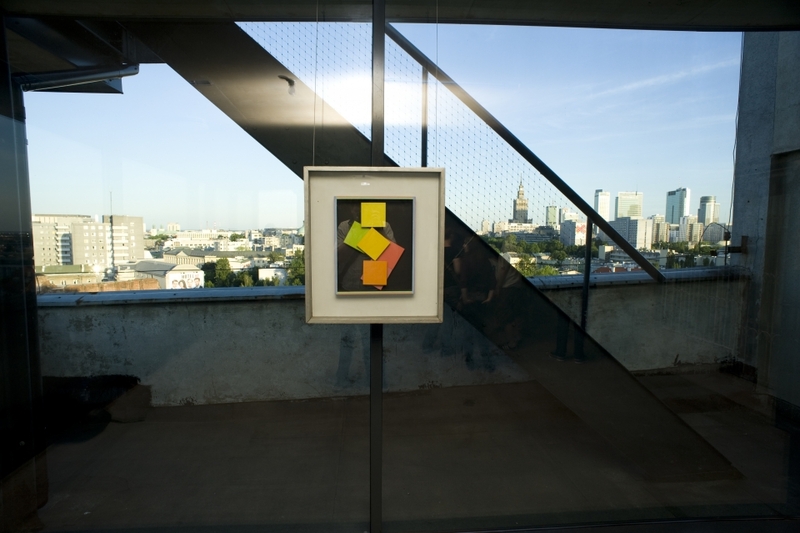 The painting’s abstract form is opposed by the reality outside the window; the panorama of Warsaw observed through the glass walls of the Avant-garde Institute pavilion and from the roof terrace reminds us of the vicinity of the former ghetto (its boundary run here) and the void left by its destruction. Leszno, the ghetto’s busiest street, with its cafés, peepshow and musical theatre, teemed with life as if in defiance of what was going on around, becoming a place of entertainment and desperate escapism. Today the street is called Aleja Solidarności, but for half a century it bore the name of Karol Świerczewski, general and communist activist. Five apartment blocks were built at the then Świerczewskiego Street, and Stażewski’s studio was located on the top floor of one of them. In attempt to confront individual memory and the personal attitude towards the Holocaust, we sent to the residents of those blocks the text of Letters about Hunger, performing, with Artur Żmijewski, a repetition of his joint action with Prof Joanna Tokarska-Bakir. Though coming from the past, the letters obviously demand a contemporary reply. At the very same Świerczewskiego Street was located the Lenin Museum, today the Museum of Independence, with its inherited collection of politically engaged art, in which our attention is drawn by the presence of avant-garde artist. Presented in the hall will be Alina Szapocznikow’s sculpture The Exhumed (1955), discovered in the institution’s vast collection. Made in reaction to the contemporary political events in Hungary, the piece addresses the theme of the creation, surfacing and revision of history. A joint exhibition by two neighbouring institutions, the Avant-garde Institute and the Museum of Independence, both sharing an avant-garde past, offers an opportunity for creating a common space of avant-garde history and postwar memory. The exhibition is bundled with a series of lectures — an opening one by Jacek Leociak, PhD (Polish Academy of Sciences’ Institute of Literary Studies) about the topography of the Ghetto (29 May 2010, 16.00), and discussions, closing the exhibition and the whole Ideoses series, with the participation of, among others, Prof Waldemar Baraniewski (Warsaw University’s Institute of Art History) and Prof Andrzej Turowski (Université de Bourgogne, Dijon), concerning the context and space of the former Stażewski/Krasiński studio (11 June 2010).